The Cook-a-Palooza Experience: Roasted Potatoes that Rock! Roasted potatoes are truly a wonderful thing. Crispy on the outside; soft and moist on the inside. Many cookbooks (including mine) have a roasted potato recipe. Most will tell you to toss the cut potatoes in olive oil, add spices, season with salt and pepper and then roast in the oven. This method is fast and works quite well but there is one extra step you should consider if you want roasted potatoes that'll rock your world! That extra step is to parboil the cut potatoes. This means boiling them in water for about 3 to 5 minutes and then draining them in a colander. After draining the potatoes I usually rinse them with cold water and let them dry for a few minutes on paper towels. Once the potatoes have been parboiled you are ready to gently toss them with the olive oil, spices (I like Cajun) and then season with salt and pepper. The final step is to spread the potatoes out on a baking sheet and roast in a 425F oven for about 20 to 25 minutes or until golden brown. Be sure not to overcrowd the baking sheet with too many potatoes. Arrange them so they are comfortably spread out like the people you see in the lawn seats at an outdoor concert. 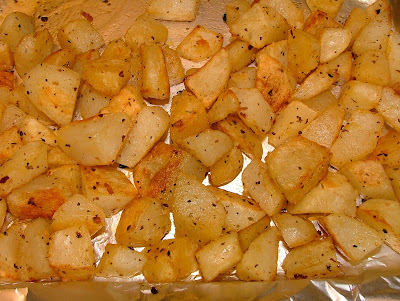 An overcrowded baking sheet will give you steamed potatoes rather than crispy roasted ones. Keep these tips in mind and you'll always end up with roasted potatoes that rock!